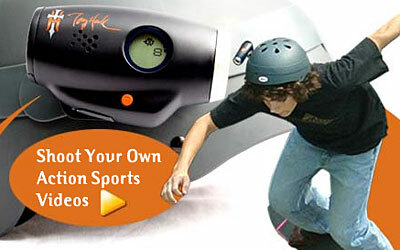 Make your own action sports movies with the Tony Hawk HelmetCam and your PC. With 32MB of memory, you can capture several minutes of action for your videos. Strap to any helmet. Aim with laser targeting feature. Press record and start shooting. Edit your helmet cam footage by adding special effects on your PC. Share your action sports videos. Start making action sports videos starring you or your friends, then turn your computer into the ultimate editing suite.